Eagle-eyed readers may recognise Flash from this article, in which I attempted to showcase some of the many different types of mule. He certainly is a good looking boy! Not only has Dorinda written about him here, in the standard Mule Tales format, but she’s been generous enough to share a short story with us as well. Read on and enjoy! All images copyright © to Dorinda Hennings. Let me introduce you to my mule, DH Hopehaven Flashin My Strut. He is a 13 yr old 14.1 bay tobiano gaited Tennessee walker mule gelding. I didn’t try him out before buying. I did view videos and did a lot of interviews beforehand. 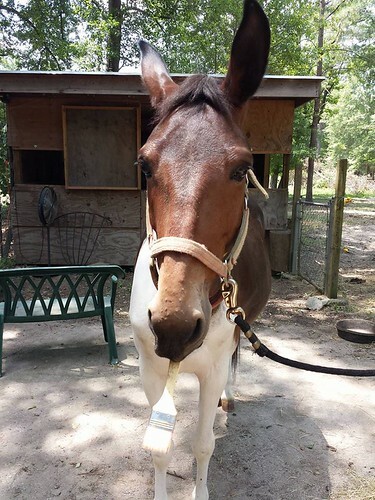 He had been ridden extensively on trails for a couple years, but had been pastured for three years and not worked due to his owner’s failing health. Flash came to us in December 2015. Flash was timid, not very confident, and would stand stiffly while being petted or handled. Flash was going to have to have patience, love, and time to be a good trail partner. For the first four months we did a lot of groundwork, lots of time just being groomed and petted. He learned to like apple slices and carrots very quickly. I rode him around my place but had a friend take him for five weeks to trail ride him out on roads and other long trails to make sure he was safe, as I am an older woman. He basically just gave him a refresher on trails. I met Flash thru a friend in the American Sugarbush Harlequin Draft Horse registry who had an elderly friend looking to sell his two mules due to frail health. 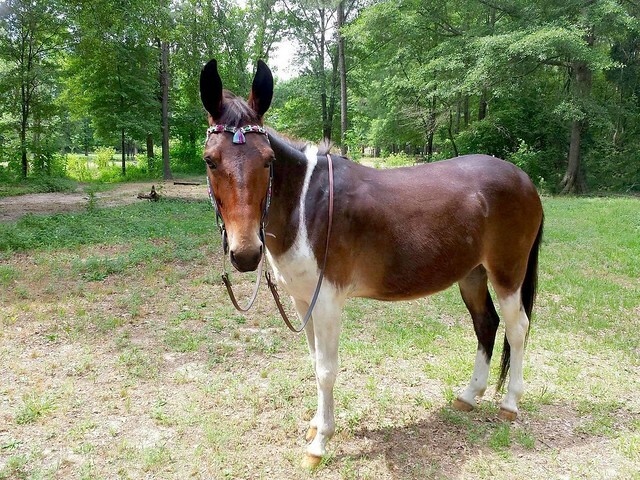 I was looking for a mule to take the place of my molly mule, Miss Sarah, on the trails due to her health after Lymes disease and EPM. She lives comfortably in retirement with us. 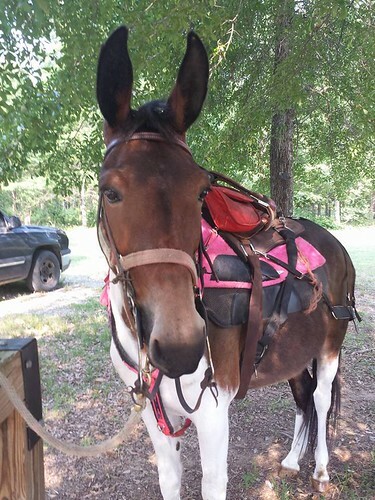 She was my first mule and I was so impressed with her work ethic, intelligence, and the deep bond we developed that nothing but another mule would do! I have owned Flash for almost a year now and he is a different mule. He expects petting and nose kisses and will nudge for a treat. Even though he’s not a confident ride, he listens well and trusts me to not lead him into harm. I also trust him if he tells me there’s something in the woods. Usually a deer will jump out as soon as he lets me know there’s something there. We just watch it go by. I ride alone often and we enjoy our little rides. He is no longer tense and worried when being handled and he is so smooth to ride!! A wonderful gait. Hence, the registered name DH Hooehaven Flashin My Strut. The American Donkey and Mule Society is putting a story I wrote called the Opinionated Mule in their Nov issue (The Brayer). 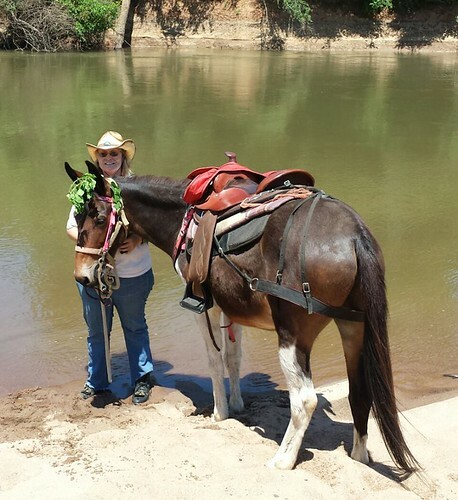 It’s a fictional story about a mule and her life with her lifelong owner. It’s based on my two mules combined (Miss Sarah and Flash). It’s about the incredible bond between a mule and their person and how horrible it would be to lose her or him. Flash is becoming a clown. He appears to want to learn to paint lol. My relationship with Flash is getting better over time. Flash is never nervous around me now. He doesn’t stiffen up when I touch him. In fact, he comes up for kisses and rubs. He is a much happier mule now, more relaxed. It’s nice to go out on a trail ride and have fun and not be worried about anything. I am teaching Flash tricks. He can smile on cue, kick up a ball and hold a paint brush. I may teach him to paint one day soon. 4. What’s the most important thing you’ve learnt as a mule owner, and what piece of advice would you give to someone new to mules? 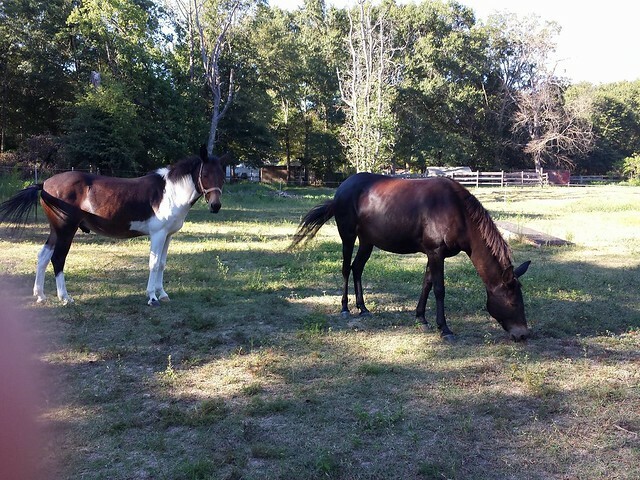 The brown mule in the pictures is DJH Hopehaven Miss Sarah Lee, who was my very first mule. She will be 21 in November. She holds a special place in my heart always. My 24 yr. old daughter, who I lost in 2011, rode her 4 days before her death. It was a good day in my daughter’s short life and Miss Sarah gave her joy that day. Actually, I learned most from Miss Sarah. My experiences with her helped me with Flash. Everything you do with a mule happens in mule time. Mule time is the time it takes a mule to decide you are trustworthy and worth bonding with. This mule time, I have learned, varies with each individual mule. For some, it can happen right off. For others, it can take much longer depending on how the mule has been treated in the past and how much positive or negative reactions he or she has been exposed to. The bonding a mule or donkey does with a human is very precious and what makes them so special. You can’t rush it. Be patient, kind, and never cruel. Training a mule is different than a horse and never send a mule to a person who has never trained mules or does not own and ride them. They think things through so little trying sessions are best for a mule. It gives them time to think about the lesson. A mule is an amazing creature. I don’t know how I had gone most of my life without one! I guess my story actually was about both my mules. In response to the usual question 4, which is “Can you share a story that you feel sums up your mule and/or your relationship with him?”, Dorinda wrote a short story about Flash. I am thrilled to be able to share this with you and thought it deserved its own section! 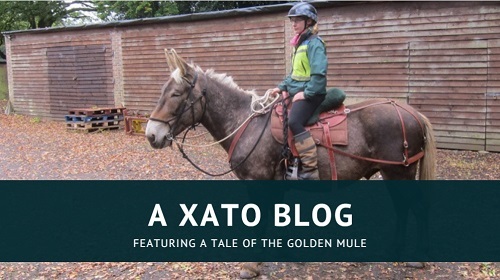 It’s a very special addition to our regular Mule Tales format. It was a cold windy day. I looked out into the pasture, squinting my eyes to find my new mule. He was standing behind some bushes. Apparently, that was his favorite resting spot. I had had Flash a couple months now – got him the week after Thanksgiving. A beautiful marked mule, bay tobiano, and he was gaited too! He was a nice boy. He had manners. He would open up his mouth when you put the bridle on. You could clip his whiskers, ears, and bridle path with no issues. Yet, he was a very reserved mule. As I looked out into the pasture at him, I sighed. Was I ever going to get his trust where he would bond to me like my other mule, Miss Sarah, had? He would tolerate you petting him and working with him but he was very tense and worried all the time. He never came running up when I came out to visit. He would never run away when you approached him but he would stand facing you, maybe taking a step back every once in awhile. He tolerated nose kisses but didn’t know what they were or why he got them. I had been working with him every evening. Mainly spending a lot of time hanging out with him in the pasture, brushing and talking to him. When riding, I always sang to help with his confidence. He loved to go riding but was a little unsure of himself out alone. With coaxing, he would go through obstacles he was unsure of. The more we rode together the better he got. While I stood there daydreaming, Flash quietly regarded me with curiosity. I had finished feeding everyone hours ago but this windy evening I wanted to make sure everyone was okay. I was feeling a bit down – had a hard week at work. I was ready to unwind for the weekend. I opened the gate to the pasture and stepped inside. I sat down on a big tree stump and closed my eyes for a few moments. It was quite chilly so I shuddered and pulled my coat closed. Slowly, Flash started moving towards me to see what I was up to. He stopped several times. After a brief hesitation, he would walk a few more steps. This was something new and I was interested to see what he was doing. Flash stood about a foot away from me just staring with his soulful brown eyes. After we had stared at each other for several minutes, he let out a big breath. With one shake of his head he walked straight up to me and nudged my hand and nickered. He stuck his nose up to be kissed and nudged me again. The joy ran through me like wildfire! I had finally been accepted. I wrapped my arms around him with happiness. He didn’t flinch or stiffen. He rubbed his head on my arm. I now belonged to a mule.